It's BMX riding. It's on the moon. What more do you need to know? 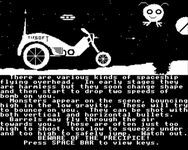 In this game you control a moon cycle which you must use to patrol the surface of the moon. There are many rocks on the ground. You must ump over them. To make them easier to jump you may try to blast them with your moon-gun! If you fire into the ground you will make a crater. These must also be jumped over. Try not to make too many craters. There are various kinds of spaceship flying overhead. In early stages they are harmless but they soon change shape and then start to drop two speeds of bombs on you. Monsters appear on the scene, bouncing high in the low gravity. These will not try to bounce on you. They can be shot with both vertical and horizontal bullets. Barrels may fly through the air towards you. These are often just too high to shoot, too low to squeeze under and too high to safely jump. Watch out.